The Minor Hockey Player of the Year race is especially top of mind at HockeyNow as we look ahead to watching former player of the year Dante Fabbro wear the red and white at the World Junior Championships later this month – assuming he makes a full recovery, of course. Getting the chance to see the Player of the Year winners compete and get drafted is one of the many great perks for us and we can’t wait to hand out the awards once again at the end of the season. The award is given out annually to one player in each B.C., Alberta and Ontario who is at the top of their game and best exemplifies leadership in their school and community. Our selection committee, chaired by International Scouting Services founder and head scout Dennis MacInnis, scouts top players in each province and provides us with monthly preliminary lists. Here are the lists for December. 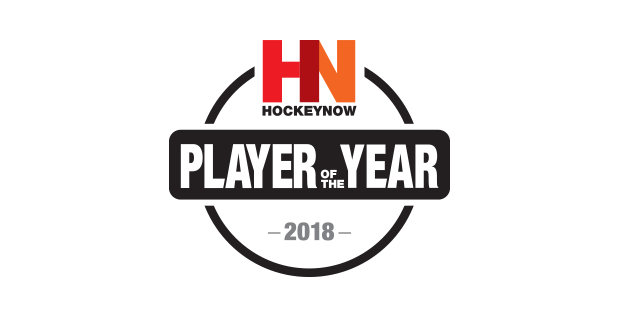 Some of these players could be HockeyNow’s 2018 Players of the Year – and could be sporting the red and white themselves someday soon. Here are the POY December preliminary lists for B.C., Alberta and Ontario. Solid puck moving d man, has good hockey sense and likes to control the tempo of the game. Two way forward, leader, character player, plays top line and distributes the puck and finds the open holes. Power forward , left handed shot , plays top line, takes key face offs, net front presence. Always seems to be around the puck and reads the play well - has a good skill set that allows him to create offense. Big forward, hard to play against, tough to handle down low, plays top line and in every key situation. Smart puck moving d man, controls the puck on the PP, joins the rush and makes smart decisions with the puck. Goal scorer and shooter mentality, very skilled expect the unexpected, shoot from everywhere has bright future. Big, strong and can get up the ice, good shut down D man in the WHL, tough to play against & controls his space. Power skilled forward that does it all and plays a mean game, plays on the edge and has lots of skill. Quick, fast, good hands in tight, plays with energy, has speed to burn, one of the best skaters in the draft. Big, mobile defender that likes to have the puck on his stick. Skates well, head up, controls the play, can be aggressive when needs to be, has a good shot from the point, will join the rush and makes good passes. Big kid, leader, captain, tough to play against,good shot, plays a mature game, good speed once he gets going. PF with high end skill, does it all with speed & skill, can score in any situation & dangerous all over the ice. Talented offensive player good shot, quick release, plays top line, likes to dangle and can do it at full speed. Big defender that plays a 2-way game but really excelled in a shut down role not flashy offensively but will chip in. Another big forward on a strong team that can really skate, uses size down low and hard to knock off the puck. Smart two way defender makes a good first pass out of his zone. Makes good decisions. Uses his partner well. Very good skater, good on edges and transition, controls the game, likes to hit and be aggressive. Good offensive player. Has all the raw abilities to take game to next level. Big kid with soft hands & a good shot. Fast, smart, captain does it all, no glaring weakness, moves the puck and jumps to holes and can finish. Has game-altering ability, Captain of his team. High end size with good footwork, explosive skater with good top speed. Slick two way defender can skate his way out of any scenario. Continues to show impressive vision/decision making. Big, strong goal scorer with excellent release - big body with good net presence. Good patience with the puck. Intelligent two-way defender, great agility on the ice, and reads the landscape at a high level - dangerous on PP/PK units. Skates well in all directions. Nice release and heavy shot. Not afraid to join rush and make plays. Huge upside. Playmaking winger with elite level upside. Consistently makes the smart play, projects as a top-line player. Fluid skater that generates a lot of power, has tools to be a dynamic offensive forward when he wants to be. One of the most well rounded players in his age group. Talented in many aspects of the game. Dynamic skating and agility continues to show a level of calmness, patience, and confidence in his own zone with the puck. Two-way defenceman makes smart reads in all three zones. Can hide release point on his shot on the rush.